A couple days ago we discussed the Fawn Grove Throw from Woolrich—the warmth, the weight, the look, and the feel. So today we’re going to take a look at the Woolrich Atlas Twin Blanket, the Fawn Grove Throw’s cousin as an alternative blanket for summer camping. This post discusses the differences in both of these Woolrich classics so that you can best decide for yourself which one you want to cover up with for a chilly camp night. Just like the Fawn Grove Throw, the Atlas Twin is more than big enough in which to wrap yourself up or to share with your camp friend while the both of you sit half-blanketed, reading a book or enjoying the warm atmosphere around a fire. 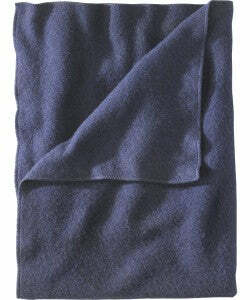 The Woolrich Atlas Twin Blanket is nice and comfy and, above all, warm! Unlike its cousin, on the other hand, the Woolrich Atlas is meant to be a heavier type of blanket. It isn’t going to deliver the same kind of soft, fluffy feeling that the throw will. However, the blanket is much more effective for layering than the throw could ever be. The Woolrich Atlas Twin is also a larger blanket than the Fawn Grove Throw. Woolrich adds 6” to one end and 10” to the other to make the Atlas 60” wide and 80” long. Keep in mind that when you buy a Woolrich quality blanket, you’re not just picking one out for camp! The Atlas Twin Blanket is especially long-lasting thanks to its bulkier feel. It’s made of 80% reprocessed wool and 20% nylon. The Atlas Twin Blanket is a blanket you’ll enjoy for the rest of your entire life! The color on the Atlas Twin are solid colors and not designs, naturally, the colors on the Atlas are deeper and fuller than the softer approach of the plaid designs that you see on the throw. Well, that just about covers it, everybody. Hopefully this gave you a clearer idea of what blanket types the two of these are and maybe even which one you’ll want for your camper. And, as always, thanks for reading!